All the children I work with are usually able to try and walk. It’s just some may need more help than others. This never deters me from giving them the opportunity to walk! If I didn’t give a child the opportunity, then how on earth will they ever get to the stage where they need less help from me? For me the sessions I give to children aren’t all about walking, so please don’t take this blog as me shouting about getting every child walking, because it’s not. What I enjoy most is helping a child achieve something their parents didn’t know was possible for them and sometimes that is walking. Equipment is a key part of being able to help a child walk. I like to use a wooden ladder as I can use myself to manually help a child stand and walk with it, plus it slides nicely along the floor. 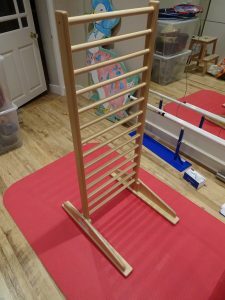 I can gradually reduce the manual help I am giving to a child and they work toward their end goal, which is for them to be able to walk with the ladder independently. 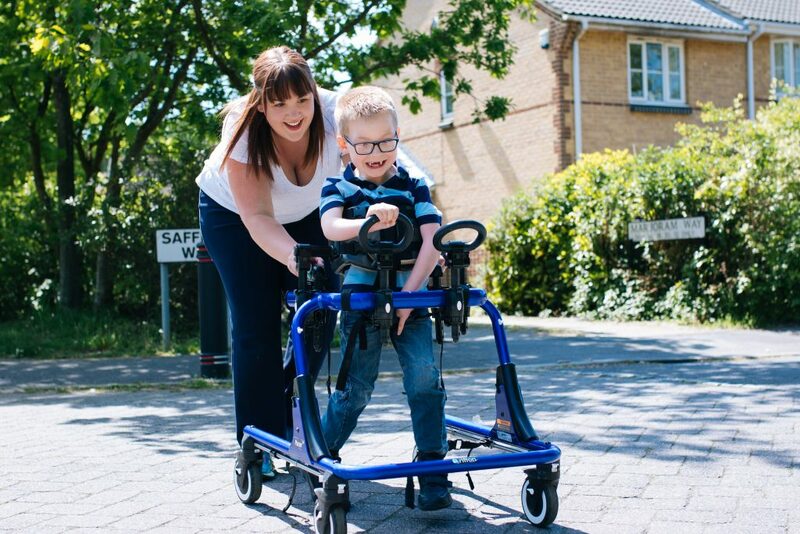 Walkers are another way to support a child’s ability to walk. These are usually funded through a NHS Physiotherapist, but can also sometimes be privately funded. There are various makes and types of walkers and each child will have been through an assessment to find the one best suited to them. These walkers can always be gradually changed to give less help to a child as their abilities improve. 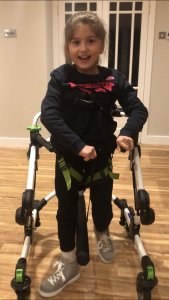 Walkers are a great piece of equipment for children to have the opportunity for some independence, which is something they don’t get very often. Finally, we have sticks. These are used by children who are at the stage where a walker might give them too much support, but they are not ready to go at it alone completely. As with walkers, there are many different types of sticks and each is used for a specific reason. Children may use two sticks or one. They also may need more surface area support from their sticks and so use a tripod stick. They may only need a small amount of support, so a single stick is adequate. Whatever it is that works best for them, this will always be ever changing though, as they are gradually achieve their goals. From sticks you go to nothing, which is always a big step, but it is something that will still take work and determination on the child’s part. There isn’t much manual support I can give at this point. I am just there to catch them when they fall and verbally encourage them before that point. Whichever stage a child may be at it will never stay the same, small achievements can be just as amazing as big achievements and so we celebrate every stepping stone they achieve.